With the cooler winter weather in Brisbane, I've been wearing my jeans a lot. After our summer heatwaves continued into autumn and I spent most of autumn in shorts, it's a nice change. Jeans also make getting dressed in the mornings with two little ones really easy. And adjusting to life with two under 2 means I'll stick with the easy path for the moment! The style challenge for the day was 'pink till it hurts' which I had originally planned to do by wearing all pink accessories. After putting the pink tank and scarf on though I quickly realised adding any more pink to the mix would be a bit of an overkill! 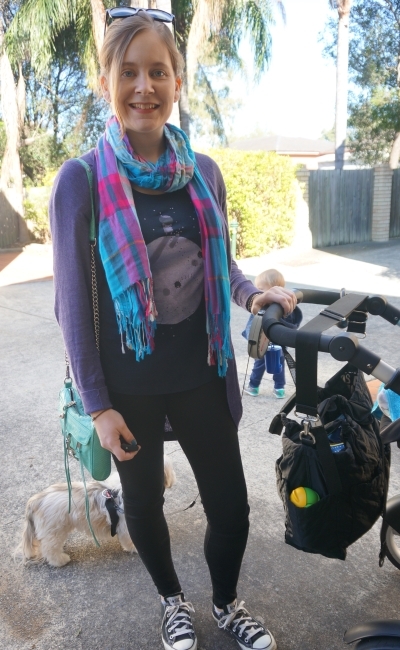 Was a nice casual (and with the buttons on the tank for breastfeeding, practical) outfit for errands in the morning and spending some time with family in the afternoon. Last worn: Ray-Ban Wayfarer, wool cardigan, pink skull scarf, pink sleeveless shirt, skinny jeans, metallic ballet flats, Rebecca Minkoff aqua mini MAC. Other ways to wear: wool cardigan and a maxi skirt, pink skull scarf and navy stripes, pink shirt and lace pencil skirt in the office, skinny jeans and a floral kimono, metallic ballet flats and a tartan skirt, Rebecca Minkoff aqua mini MAC and denim shorts. I went with a simple scarf to meet the prompt for the 'plaid is rad' challenge. I really like this pretty tartan scarf my sister brought me back from her travels in Europe. This was a really simple outfit for a simple day. We had been having a tough couple of days and although I had planned at the start of the week to go out to playgroup, decided to stay home instead. Having a baby is a great reason to be kind and take time for yourself when you need it, and not try do too much. Having two under 2 is an even bigger reason! Since toddler T enjoys doing some activities out of the house each day, I decided to take the boys to the local park. It was a bit chilly so toddler T had the slide all to himself too. It was a nice quiet alternative to a noisy playgroup and gave us a chance to relax a little. Last worn: Ray-Ban Wayfarer (above), tartan scarf, purple cocoon cardi, graphic tee, prima skinny jeans, Converse, Rebecca Minkoff aquamarine mini MAC (above). Other ways to wear: tartan scarf and a striped tank, purple cardi and a teal dress, graphic tee and a blazer, prima skinny jeans and a floral cami, Converse with a striped dress, Rebecca Minkoff aquamarine mini MAC and a maxi skirt. Linking up with Hello Monday, Modest Monday, Classy Monday, Mix It Monday, Turning Heads, On Trend, Confident Twosday, Style Sessions, Wardrobe Wednesday, Midweek Inspo. I love the simplicity of denim looks. They are just so easy to wear! You look gorgeous! Having little children is the perfect reason to take things a little slower, I couldn't agree more. The cutest of cute!! 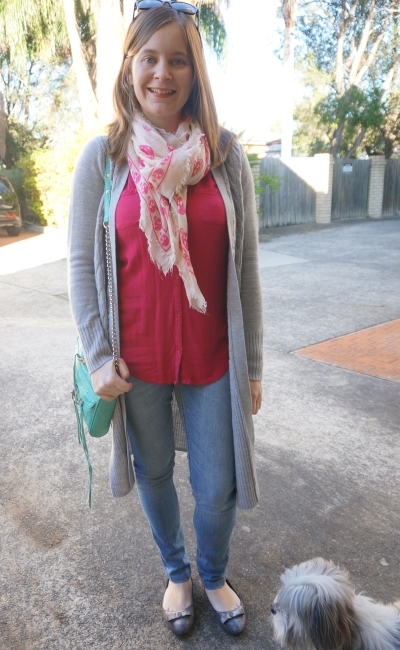 Can't go wrong with the skinny jeans/colorful scarves/cozy cardy combo! Love! With two under two you pretty much have carte blanche on what you chose to wear dear Mica. Even if he refuses to look at the camera, haha! What cute scarves! I can;t wait until it's scarf season here again. Plaid is rad and I love the scarf! I'm actually wearing PJs of a similar pattern right now, ha. Both of your outfits look amazing and cute! You're so incredibly in shape so soon after you had your second baby, wow! I truly love the sporty vibe in the second look, dear! Running around with two under 2 helps drop the baby weight ;) haha! Yes easy is best with two little ones! Great looks ! I love them both. Awesome! Pretty much lovin all you wore here.. Sometimes you need to changes to your plans when you have kids! There is the saying, "We plan, God laughs" and that is especially true with children! Love these two casual outfits! You have such a great collection of scarves! Very comfy and stylish looks! I love the purply colours in that last outfit! Cute scarf - I just love that pattern! Loving that super cool skull scarf! So cute, simple and chic! If only the office counted jeans as an every day thing. (; I could live in jeans. Especially my favorite pair. It really just makes getting dress a breeze! And yep, definitely a lot less stressed out today! Some days you just have to admit it's been tough and take it easy to 'rest' as much as you can with two little ones! I love your sweater and scarf in the first outfit! So cute! This is a reminder that I need more cardigans in my life! Hehe running after the little ones takes a lot of the weight off! I love the scarf!! This look is just perfect! I love your scarves! 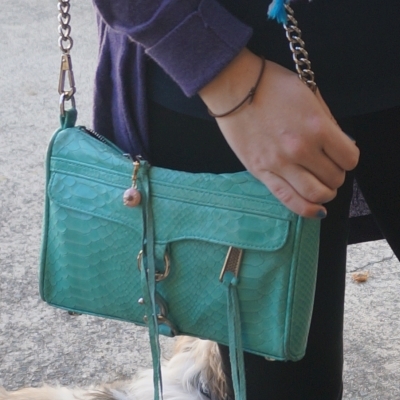 They are the perfect finishing touch to your outfits! haha yes they can all have fun playing in the mud together! Haha, given theme overkill probably would have been appropriate, however I like your perfectly proportioned amount of pink! Thanks Lydia :) I think it was just the right amount of pink too. I love that you have been doing some fashion challenges lately. Love the outfit in the pink and both scarves are pretty. You have the ability to put together easy simple outfits with the right layering. 😀 I would have enjoyed the empty playground too. Welcome by and linkup with me today Mica. Thank you and have a splendid weekend! I have been kind of nail polish crazy lately., I do my own gel nails at home. 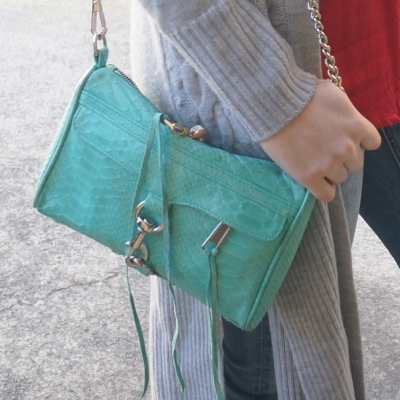 Beautiful RM bags, and love the jeans on you. The second outfit is fun and playful. You look great! I always love checking out the scarves you are wearing! I am such a huge fan of scarves and there are so many fabulous ones out there. And you always have such gorgeous ones! Please stop by and link up with me On the Edge of the Week!